Go to any Middle Eastern restaurant, and aside from having a decent choice of delicious vegan hot or cold starters (lots of these vegan by default); the main course that more often than not pops up is ‘Vegetarian Bamia.’ Now this should always be vegan, I’ve never known it to contain dairy, but do check if in doubt. The NON-veggie version is lamb with okra, but who needs to eat an animal when it’s the spices and the okra texture that are the main attraction here anyway? 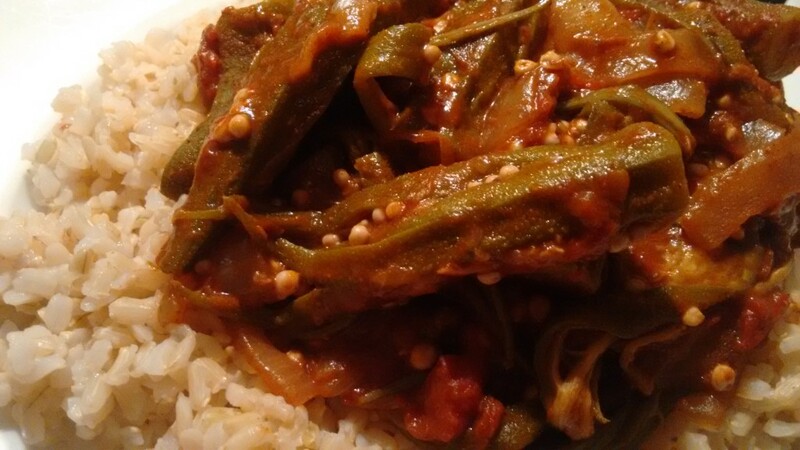 ‘Bamia’ is the Arabic word for okra, but it’s also the word for the traditional spicy tomato-based stew that contains it. It’s delicious, super easy to replicate; healthy; and as the spice flavour is quite subtle I’d say it’s pretty kid-friendly too. This is a bamia recipe from an ancient cookbook called ‘Cooking Class Middle Eastern‘ and looks like it was part of a set from an Australian ‘women’s’ magazine. Lord knows how I came to have it. The recipes are pretty sound though and even though it’s not a vegan cookbook, many of the recipes are. 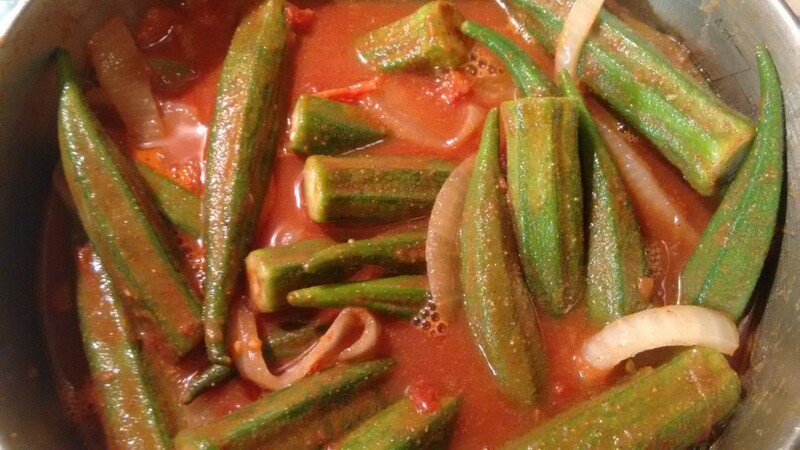 The recipe in the book is actually called ‘Okra With Baby Onions And Tomato.’ Maybe they didn’t think people could handle the word ‘bamia’? Feel free to adjust amounts as you see fit or according to how many people you are serving. 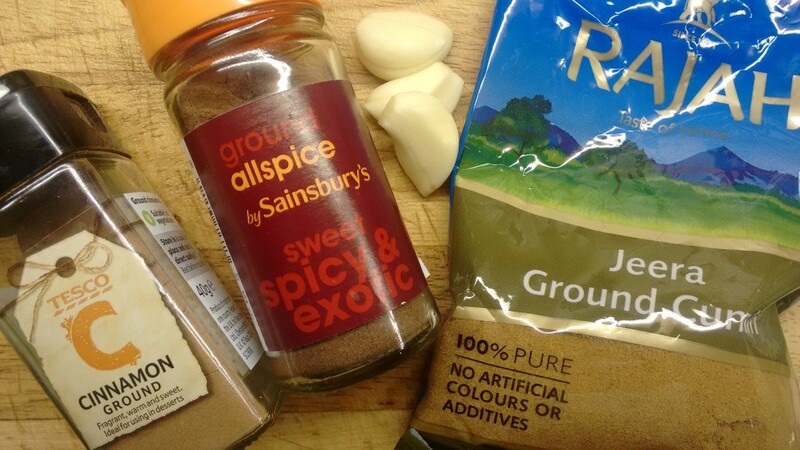 I’ve put the amount as per the recipe for the spices and garlic but you could add extra cloves of garlic and 1/2 to a whole teaspoon more of each spice if you want more taste – I ALWAYS add more! the fixin’s for the bamia flavour! 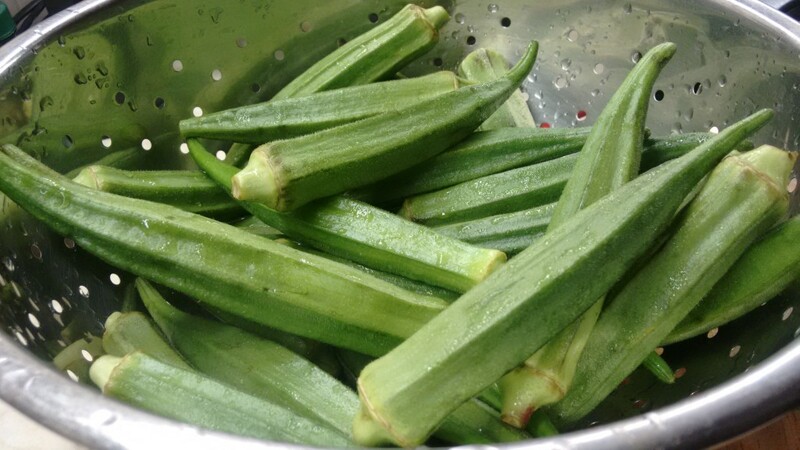 Give the okra a good old wash. It’s hard to get organic okra, so just rinse it well and drain in case of pesticide residue. 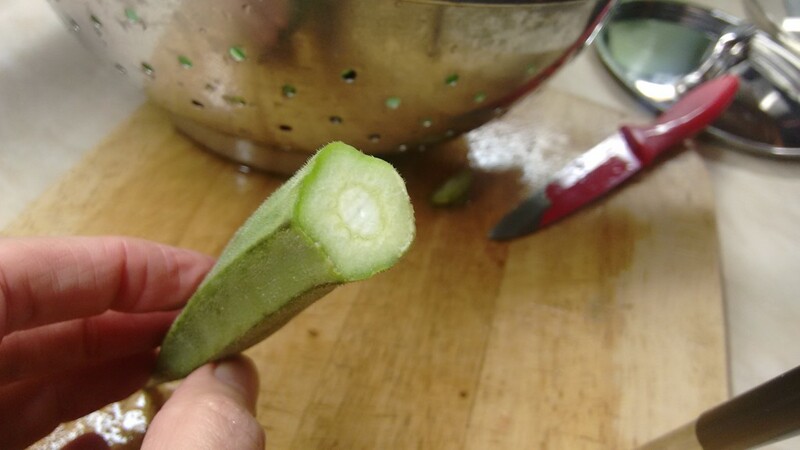 Cut the tops from the okra, taking care not to puncture the pods. 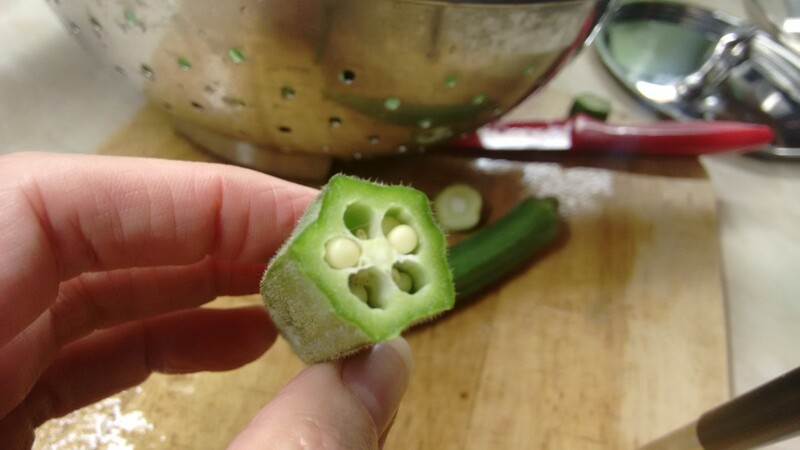 If you cut them too far down you’ll end up with mushy okra, as the liquid will seep into the pod and mush it right the heck up! You’ll accidentally cut too much off a few tops, but as long as the majority are ok, that’s fine. Heat a small splash of olive oil in a pan, and saute the onions for about 15 minutes or until they are browned. Remove from pan – just keep them in a bowl until you are ready for them. Heat another splash of oil in the same pan, add okra, garlic, and spices; and cook, stirring constantly for about 5 minutes or until okra is fragrant and lightly browned. Return onions to pan and add the can of chopped tomatoes and the stock. 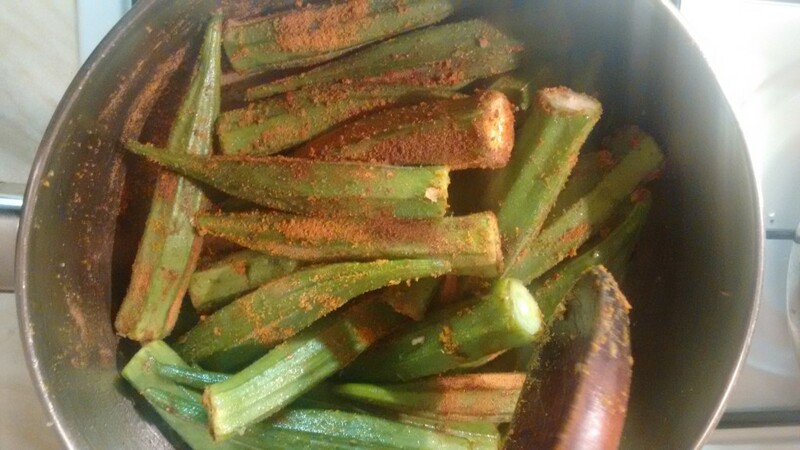 Simmer, uncovered, for about 40 minutes, stirring occasionally, or until okra is very soft and tomato mixture is thickened. Serving suggestions: Can be served over rice, quinoa, baked potatoes, wholemeal toast etc. 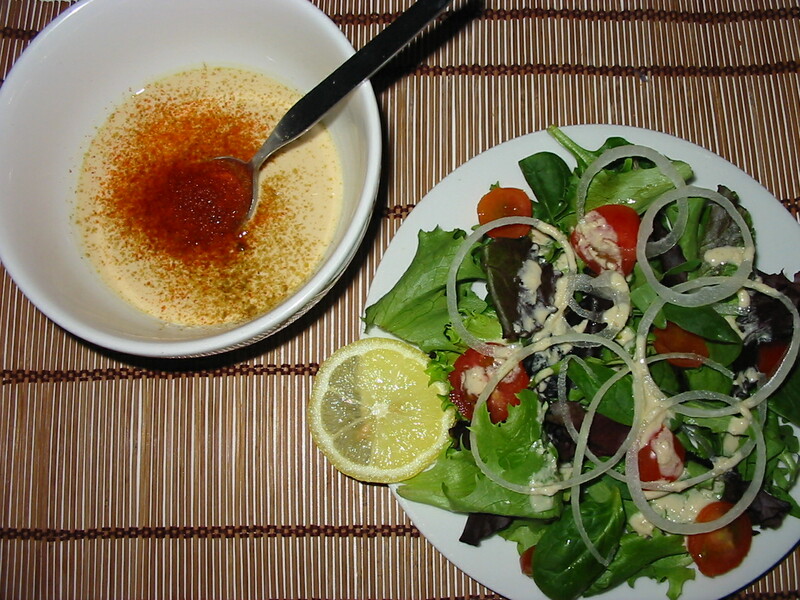 I’ve been making this tahini sauce for years. 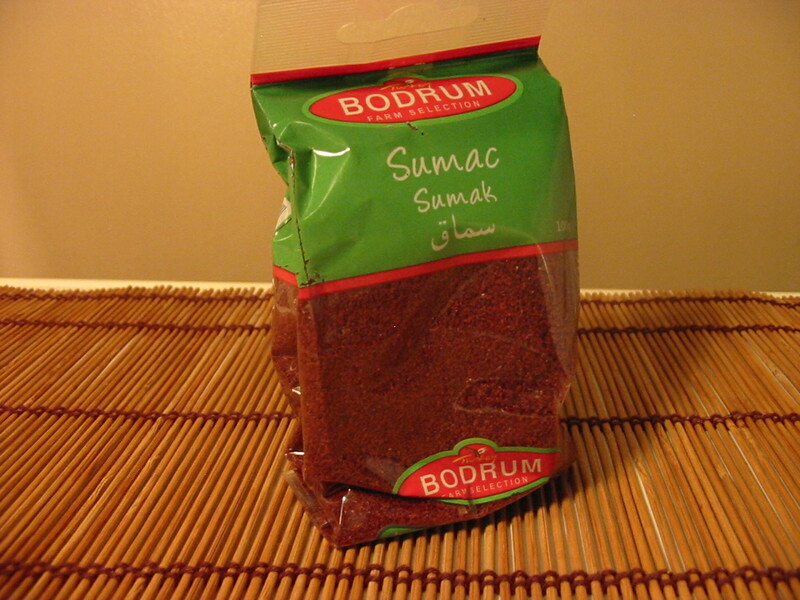 It’s probably most well-known as an accompaniment to falafel, but it’s also yummy as a salad dressing, great on baked potatoes, you can mix it up with falafel and/or salad and stick it in a pita pocket, or you can just plain ol’ dip into it with a pita soldier or a rice cracker. Tahini is basically ground sesame seeds. Sesame seeds are a fabulous source of calcium. You don’t need the milk from the cow when the seed of the sesame is around. They are also an excellent way to get your copper, manganese, magnesium, iron, zinc, selenium, phosphorus, and vitamin B1 needs met! Try and get the paler tahini. Some might say the darker one is better as the seeds are unhulled; but the paler one made with hulled seeds is just easier to work with for this sauce. The dark one can taste a bit bitter. You can find tahini pretty much anywhere these days, even supermarkets. If you can, I’d try and get it from a local Asian/Middle Eastern grocers. Some of the tahini I’ve bought in health stores is a bit heavy. The real thing made in the countries that use it the most, seems to be best. It’s not expensive at around £2.50 for 454g (1lb). This is really economical as you only use a small bit for each batch, so it lasts a good while. 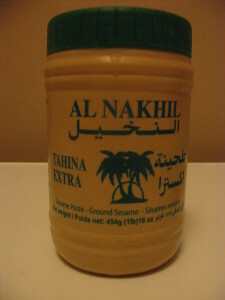 My favourite tahini is the Al-Nakhil brand. It’s Lebanese and has a gorgeous, creamy, smooth texture. I’m sure there are lots of other great Middle Eastern brands. Look around. I’ve given specific amounts of each ingredient above, but tahini is really made to taste, so do feel free to add more or less of each ingredient to suit you. The only important thing is getting the right salt taste to lemon ratio, but you will identify this when you taste it. If you’re making it for the first time, and just for a couple of people, I’d start with three tablespoons of tahini, and put them in a cereal bowl (one that has quite high sides if possible). Then fill a jug with water (filtered, preferably) to put next to you. Pour a little of the water into the bowl, so it comes approximately 1cm over the top of your tahini. Then grab a teaspoon and stir rapidly. If it is too thick, pour in some more water, and stir again. Continue to do this, until it is almost the consistency of milkshake. PRETTY IMPORTANT NOTE: At the beginning of the stirring process, the mixture WILL curdle and look disgusting, but don’t worry, it all comes back together again and looks creamy and dreamy after just a little more stirring. Got the creamy milky texture back? – Add a tiny touch (really tiny) of olive oil, and stir it in. This just helps keep the texture smooth. Now to flavour your tahini sauce. 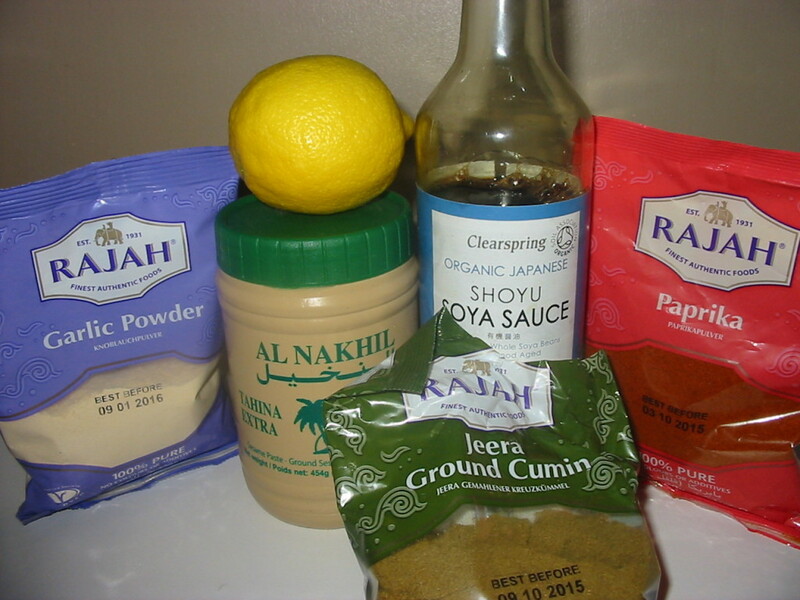 Firstly, add a drop (maybe 1/2 tspn) of soy sauce to salt your tahini. Just keep adding half teaspoons and tasting it until you are happy. Then add lemon juice. I’d start with the juice of half a lemon, and increase it if you need more. You want it pretty zingy, to complement the salt taste. When you are happy with the lemon/salt taste ratio (your tahini should already be tasting pretty darn good btw), add a 1/2 teaspoon of garlic powder, or more if you love garlic, and stir it in. Check your consistency is good. At this stage you want it to be the consistency of milk. Don’t worry if it is a little bit thicker. You just don’t want it too thick, as it will thicken as it stands. If it is too thick, just keep adding a little water, making sure not to dilute your flavours by adding a little more of each, if needed, until you get a thinner liquid. Sprinkle 3/4 of a teaspoon of ground cumin, and 3/4 teaspoon of paprika over the top, and leave to stand for around 15 minutes for the flavours to mingle. It will last in the fridge a couple of days, and you will need to give it a quick stir each time you use it again. So you have a get-together with friends planned, and you are partly responsible for choosing the restaurant you’ll all eat at ? If you’re a new vegan, you may think your choices are limited, or that you’ll have to leave it to someone else to choose the venue, and just put up with a plate of lettuce when you get wherever you’re going. Yet, it was so. And really not so very long ago. I remember a meal, around 12 years ago, in a smart(ish) restaurant in Clapham, London, where, despite the fact that the staff thought they were cultured, cosmopolitan and sophisticated, all they could offer me was a bowl of lettuce. Um… yeah. Grim. Unless you live in a tiny village (though even if you do, I’m guessing there’ll be a Chinese or Indian restaurant at the very least, not too far away) your biggest problem is which restaurant to choose from the many options available to you. If you are lucky enough to live somewhere where there is a good vegan restaurant, don’t be afraid to suggest this to your friends. You’d be surprised how many people (while maybe not ready to go fully vegan) are open to trying plant-based food. Even if there is one stick in the mud friend who says they would miss their meat (though does anyone actually say this?) hopefully they will be swayed by the opinions of the majority. If you suggest a vegan restaurant and it gets the green light from everyone, make sure it is a tried and tested, good place. You’ll want everyone to get the best impression possible of your diet. And once there, don’t hesitate to make recomendations – even great restaurants have some dishes that aren’t as good as others, so advise where possible. Being vegan is your opportunity to get to know many delicious cuisines from around the world, several of which don’t habitually use dairy anyway, (so no awkward questioning of waiters, checking that there’s no milk, butter, cream etc in a dish – phew!). Starters: Poppadoms with chutney (avoid the yoghurt-y dips), onion bhajis, spinach pakodas, uttapam, sev puri, veg samosas. Mains: Vegatable malabar, bhindi bhaji/curry, chana masala, tharka dahl aloo gobi, brinjal bhaji, sambar (Don’t worry if you don’t know what the dishes are, there should be a description of each dish on the menu, and you can read up online and even decide what you’ll have beforehand, if you really want to make it easy). At the very least, there should be a vegetable curry on offer. This is probably the least interesting of all the cuisines I’m mentioning here, in terms of vegans being well catered for, but I appreciate that this might be the only option for some people in out of town areas. Mains: The go-to choice if there’s nothing else is tofu and stir-fried mixed veg with steamed rice. In a city restaurant you may get a choice of specific veg dishes, like green beans or bok choy in garlic sauce for example. 3. 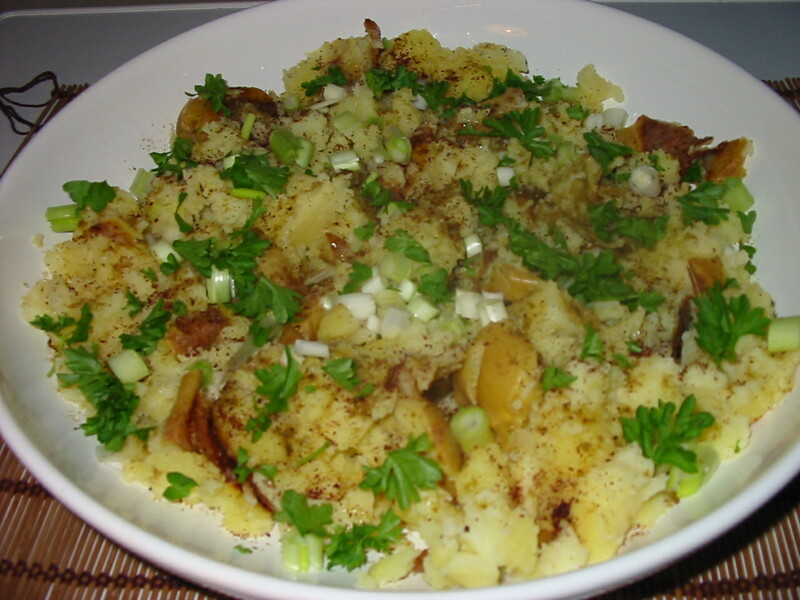 Lebanese (Syrian, Iraqui, Israeli and Egyptian are similar in their dish offerings). It is usually a good idea to get several hot and cold starters – these are normally more interesting than the mains, and you can share and let everyone have a taste. Choose from houmous, baba ghanoush, moutabal, hot or cold ful madamas, makdus, falafal, stuffed vine leaves, tabboulleh, moussaka. 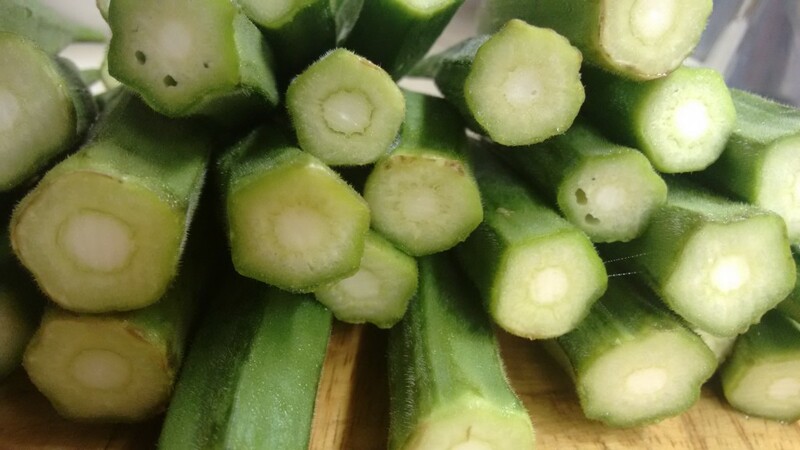 If you do need a main, spinach or okra bamia is the way to go (maybe marked as vegetarian bamia). Starters: Soup (there is often miso soup available, or various veg in clear, soup with tofu), kimchi, pickles (there are several different sorts of kimchi and pickles to try – all delicious), salad (often involving seaweed and tasty dressings – check these are vegan, lots are). Mains:There should be a veg option in the bibimbap (menu may call this ‘pot dish’) section, and in the noodle section of the menu. Try soba noodles. These are made from buckwheat – a whole grain. You should also find some variation on the following dishes: grilled aubergine in miso paste, stir-fried tofu and mixed veg in soybean paste stew, cold soba noodles in spicy chilli sauce. Desserts: Try cinnamon punch (non-alcaholic) if they have it, and don’t forget to sup on the traditional Korean barley tea throughout. I am not even going to try and be clever and name the veg stews available in Ethiopian restaurants. They have several, all clearly marked. You choose one to eat with your yummy ‘injera’ (Ethiopian bread resembling a pancake, but made of teff, a fabulous wholegrain). You don’t need to check if the stews are dairy-free, they are. 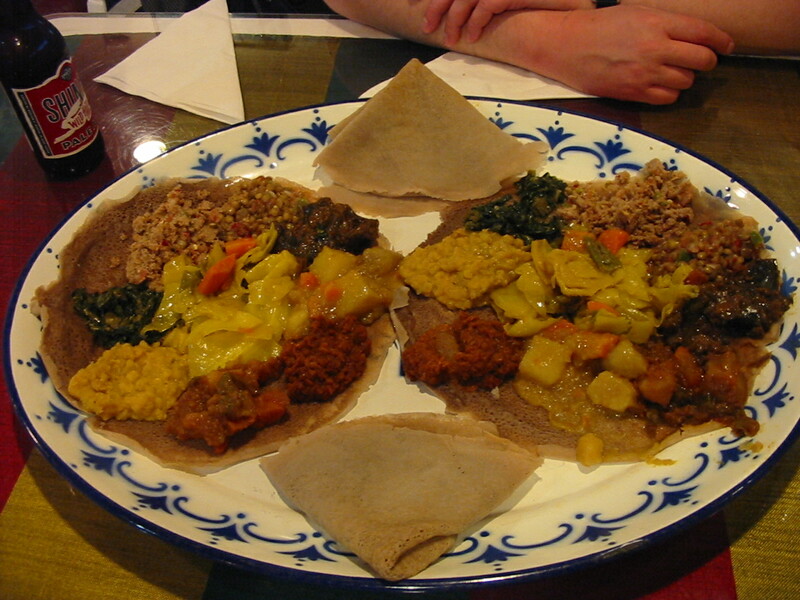 Dairy is not used in Ethiopian cooking at all. Most times there will be an offer on the menu where you get a selection of the veg stews at a fixed price. Marvellous. What could be easier. Once you’ve tried Ethiopian food, you’ll be hooked. Point your peepers at this plate of heaven! If you think this is just a variation of Chinese food, think again. 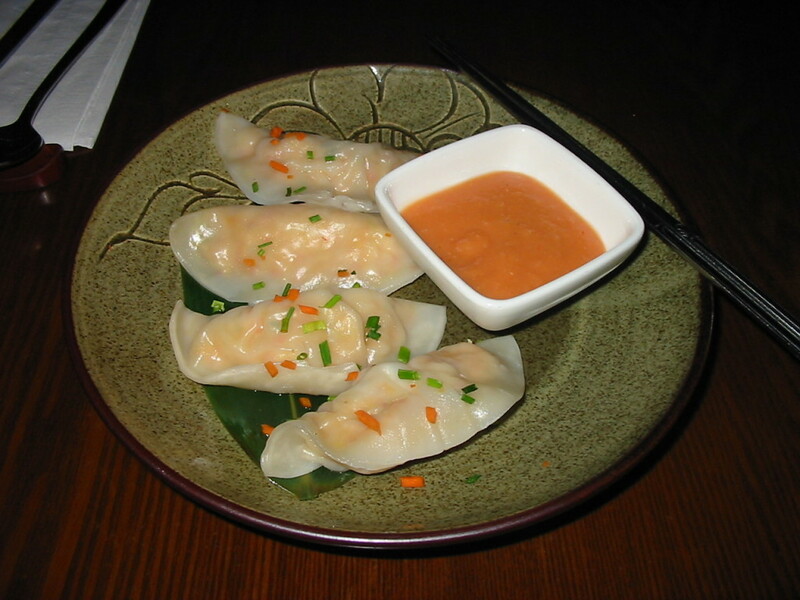 Starters: Vietnamese spring rolls in peanut sauce (some restaurants call these summer rolls), salads. Mains: Fried aubergine on garlic sauce, fried tofu in garlic sauce, fried mange-tout/bok choy with garlic sauce. Steamed rice or udon noodles as a base. Desserts: Truth be told, the whole reason I included Vietnamese food here is cuz of this scrummy dessert called Che Thai. It’s a long drink made of coconut milk, with bits of fruit (usually jackfruit, lychee or longan) and chewy jelly chopped up and thrown in. It’s pretty sweet, which I’m guessing is due to a high sugar content – but you’re not gonna have one every day, right? Never be shy about checking for egg or dairy if you’re not sure, just smile and be lovely while you’re asking. Where possible (and only if in small groups!) let everyone try your dish – show them animal products are not the be all and end all of a dish. And, oh yeah… bon appetit! I love hearing about great restaurant vegan food experiences. Please share yours with me in the comments.